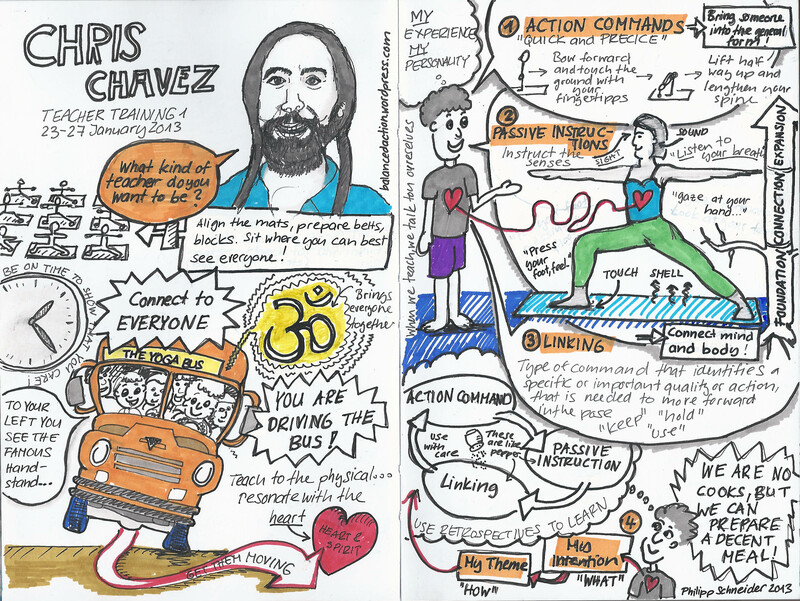 I recently started to create sketchnotes when attending Yoga workshops or trainings. Using words and pictures I can better capture and remember what I learn. Some friends and fellow yogis asked me if I could share my notes, so here they are. 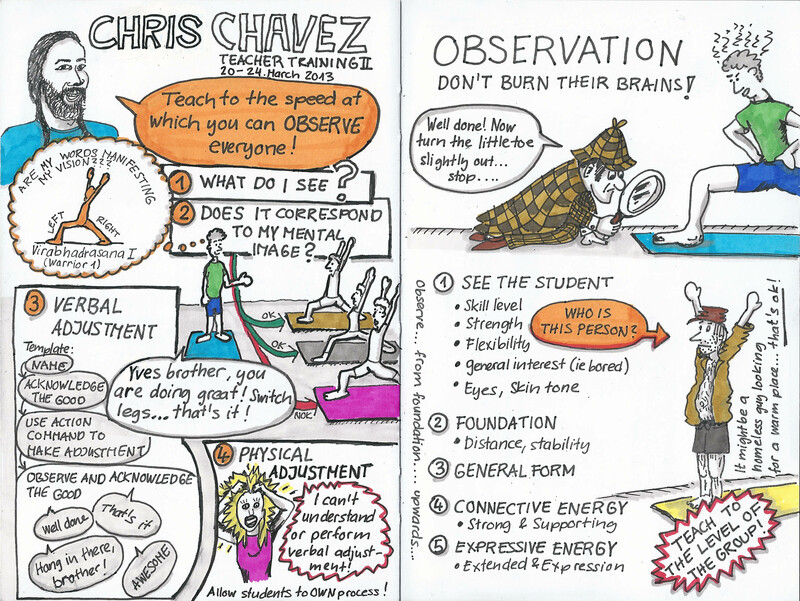 Chris Chavez is an amazing teacher. His trainings are full of passion, wisdom and anecdotes from decades of teaching. I hope my notes manage to capture and convey some of his spirit and energy. Visit one of his classes if you ever have the possibility! I would also like to thank Stefanie Zimmermann for creating an unforgettable learning experience in my hometown of Zürich. 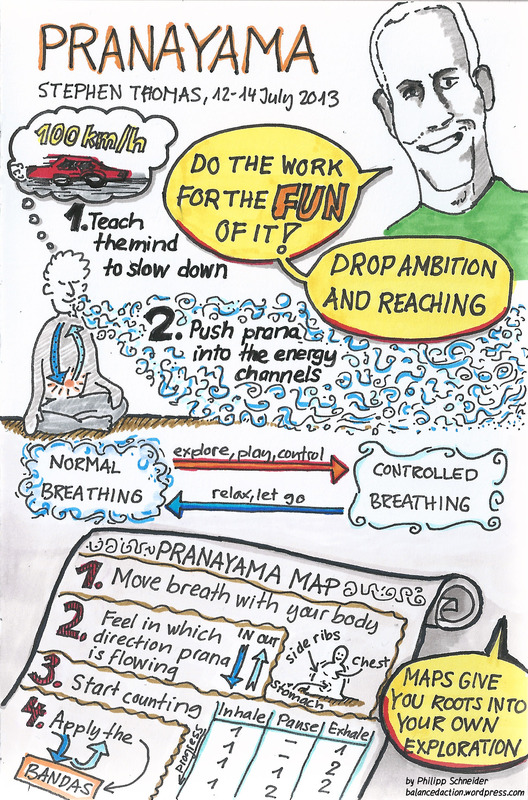 I still remember how strange the first Pranayama exercises felt to me. The first Kapalabhati, pumping away like a happy, little steam engine, or my complete puzzlement at hearing the clicking sound of Jivan Bandha all around me. I’m grateful to all the teachers who introduced me to the magic of Pranayama. If you are interested in learning Pranayama I recommend the four-day workshop Stephan Thomas is offering. With him I understood and felt how the control of the breath can calm the mind and completely change your practice. Thank you so much Stephan and Manuela for sharing your knowledge and humor. These are absolutely fabulous! Takes right back to Chris’s class when I was but an infant yoga teacher. Thank you Rommy. Glad that you like the drawings 🙂 . 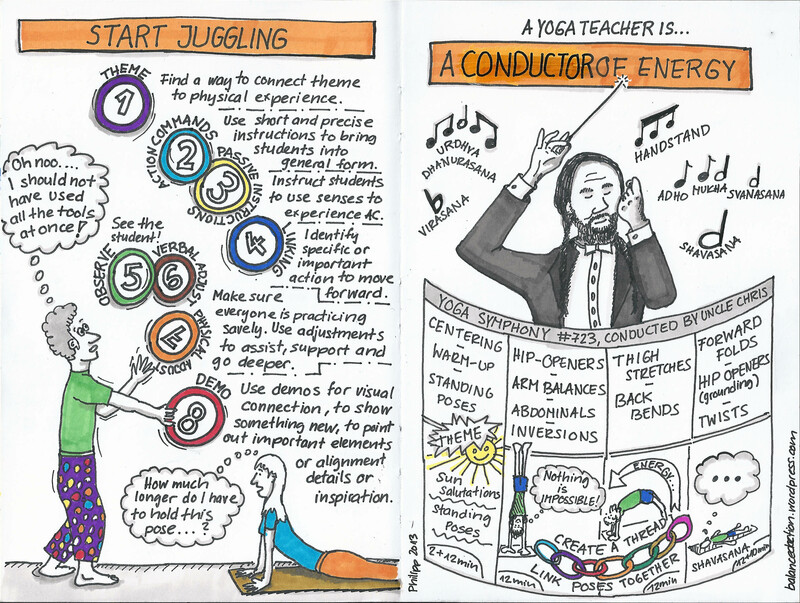 I learned so much during teacher training 1/2 and am looking forward to part 3 in May. I use to draw yoga notes but this one is a masterpiece…I really really love it. Best way to learn and remember. And so entertaining! Thank you much 🙂 . I love the fun stories and anectodes Chris uses to teach. It really makes it easy to create an entertaining sketchnote. I’m overwhelmed by the positive feedback. Namaste. I am also a Yoga enthusiast and a couple of minutes back, I got back from an Asana-Pranayama-Meditation class. Keep sketching and writing. Your stories are wonderful and I will keep coming back. Namaste back from Switzerland 🙂 Thank you for your kind feedback.